Remember back in March when we brought you the empowering story of Emily Roebling, who took over and completed building the Brooklyn Bridge when her husband and father-in-law got too sick to finish? Ladies like Emily were doing it for themselves. And she’s hardly alone. 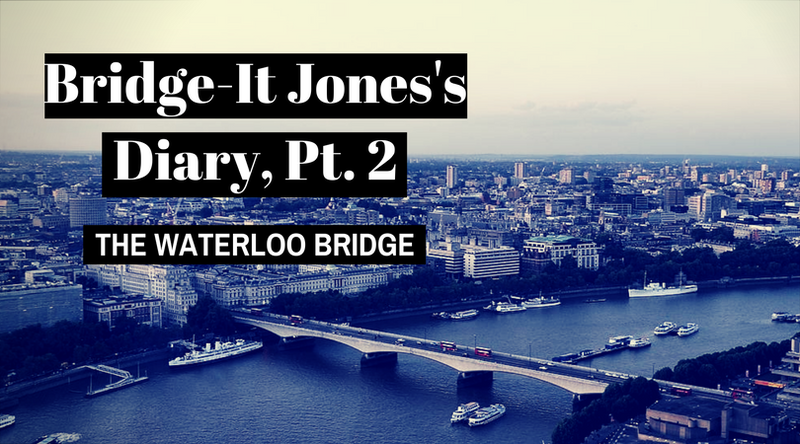 We’ve written about ladies and we’ve written about bridge, but today we bring you the story of “The Ladies’ Bridge,” also known as the Waterloo Bridge, in London, England. When England sent its young men off to fight in World War II, about 25,000 women stepped up to fill construction roles (at about half the rate of the men’s pay). Many of these women worked on the construction of the Waterloo Bridge, in London stretching over the Thames River. Ladies! We get the job done. In their spiel to tourists, Riverboat tour conductors on the Thames River tend to mention that the bridge was called the “Ladies Bridge,” and relay this story of female wartime effort where 75% of workers on the project were women. But until recently, they would add an asterisk, noting that this story was only anecdotal and had never been supported with evidence. For a long time – like, a loooong time – womens’ work on the bridge went unacknowledged, because there was no photographic evidence of women working on the bridge. The archive was “lost” in the 1970s when the construction firm Peter Lind went under, and without photographs or records, no one could “prove” that women indeed worked on the bridge. (No one ever required photographic evidence to prove that men worked on a bridge, by the way). Maybe if this Monet of the bridge was a little less blurry. Luckily, a hero appeared to cut through this obvious BS of “missing records.” Christine Wall, a construction historian at University of Westminster and a real Nancy Drew for the modern age, dove deep into the archives to settle the score once and for all. She interviewed the daughter of Peter Lind, who recalled seeing women working on the bridge during the war, and several others whose oral history served as a testimony to the truth. Part of the challenge was in getting women to admit to their contributions– they’d downplay their work, saying, “oh, it was nothing.” Where’s Sheryl Sandberg when you need her? Good thing Wall also found extensive photographic and video evidence of women in construction. And specifically on the Waterloo Bridge. Binders full of women. Here, three acetylene welders cutting girders, whatever that means. She has a name. It’s Dorothy. In 2005, Wall teamed up with filmmaker Karen Livesey to make a documentary, The Ladies Bridge, now available on Netflix. The Women’s Engineering Society has been hard at work trying to get a plaque on the bridge commemorating men and women working together, and London’s mayor has endorsed their efforts. It only took several decades for Emily Roebling, so we’ll see how long before a plaque goes up in London. In the meantime, Wall’s documentary is an excellent reminder that the absence of evidence is not proof that something didn’t happen; it just means you need to look harder.